Tretinoin is the acid form of vitamin A and is also known as all-trans retinoic acid or ATRA. It is a drug commonly used to treat acne vulgaris and keratosis pilaris. It is available as a cream or gel It is also used to treat acute promyelocytic leukemia. It is also available as a generic. Its success in treating acute promyelocytic leukemia was a major breakthrough in the treatment of this type of leukemia.It works in APL because the majority of cases involve a chromosomal translocation of chromosomes 15 and 17, which causes genetic fusion of the retinoic acid receptor gene to the promyelocytic leukemia gene. This fusion PML-RAR protein is responsible for preventing immature myeloid cells from differentiating into more mature cells. This block in differentiation is thought to cause leukemia. Tretinoin is commonly used in dermatology drugs, which is the department of vitamin A (Victoria methanol) metabolic intermediates.It mainly affects the growth of bones and epithelial metabolism, can promote epithelial cell proliferation and updates, and can inhibit the proliferation and differentiation of keratinocytes, so hyperkeratosis can be back to normal. Therefore many complete or incomplete keratosis, hyperkeratosis of diseases have a certain therapeutic effect, treat a variety of skin diseases. The use of the drug can penetrate topical skin quickly, enable significantly increased epithelial cell turnover. This class of drugs has strong and rapid inhibition on the secretion of the sebaceous glands, can reduce sebum secretion. 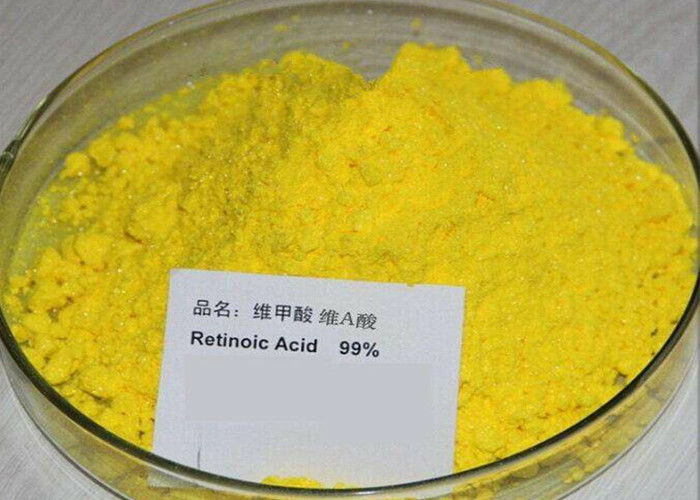 In addition, the product also has anti-tumor, promote wound healing and anti-inflammatory effects.